Are Soba Noodles Good for Weight Loss? Soba noodles look like whole-wheat spaghetti, but they possess a nutty flavor thanks to their defining ingredient -- buckwheat flour. While you can include soba noodles as part of a weight-loss diet -- they have fewer calories than spaghetti and they're good sources of fiber and protein -- they will only help you lose weight if you watch the amount you eat and make sure you don't exceed your daily calorie goal. When you buy soba noodles, check the ingredients because they're not all the same. Some brands are made from 100 percent buckwheat, but many are made from a combination of wheat flour and buckwheat flour. These differences may impact overall nutritional value, so it's also a good idea to check the nutrition facts panel on the brand you buy. 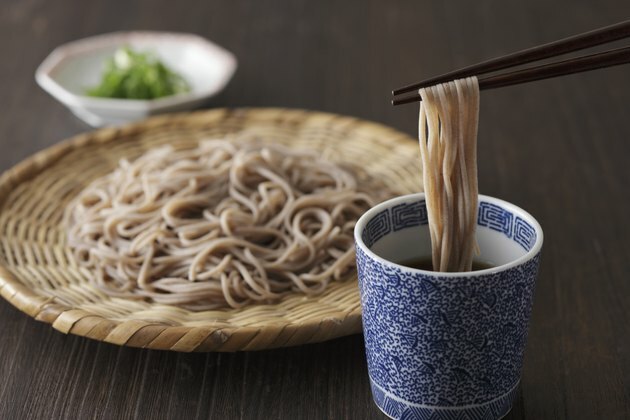 Buckwheat is not related to wheat and is naturally free of gluten, but soba noodles mixed with wheat flour do contain gluten. Some may even include extra wheat gluten in the list of ingredients. The varying ingredients in soba noodles result in a range of calories per serving, depending on the brand. A 1-cup serving of cooked soba noodles contains 113 calories, according to the U.S. Department of Agriculture. Soba noodles are a good choice for reducing calories because they have 108 fewer calories than the same portion of regular spaghetti and 61 fewer calories than whole-wheat spaghetti. They have barely a trace of fat and only about half the carbohydrates of regular spaghetti. The fiber and protein in soba noodles may help you lose weight. Both nutrients make you feel full and sustain the sense of satiety, so it's easier for you to eat less. Fiber and protein also help keep your blood sugar balanced. When you maintain steady levels of blood sugar, your body is more likely to burn stored fat for energy, and you'll avoid the pangs of hunger that arise when sugar levels drop. One serving supplies 3 grams of fiber and 6 grams of protein. These values equal 12 percent of the daily value for both nutrients, based on consuming 2,000 calories daily. Soba noodles are good sources of manganese and thiamine; they do not provide a significant amount of other nutrients, according to the U.S. Department of Agriculture. This is a definite disadvantage when you're trying to lose weight and need to pack more nutrients into fewer calories. However, you may find some brands deliver more nutrients than others due to differences in ingredients. Enjoy soba noodles and add more nutrition by turning the noodles into a salad with chopped spinach, peppers, broccoli, carrots, cabbage, onions or any combination of your favorite veggies. You can also try mixing tofu, peanuts, edamame or chicken into the salad.